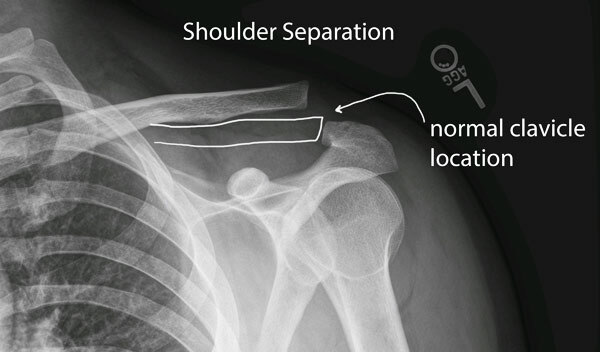 A shoulder separation occurs when the collar bone is separated from the shoulder blade. The two bones are connected on the top of the shoulder. When the collar bone separates, it moves up and looks like a bump on the top of the shoulder. A shoulder separation usually occurs after a person falls directly on the side of the shoulder or something hits the side of the shoulder with a lot of force. Quarterbacks are likely to get this injury when a tackler drives the quarterback into the ground directly onto the shoulder. Other violent injuries can cause a shoulder separation like a fall from a bicycle or a motor vehicle accident. Most people with a separation have immediate pain on the top of the shoulder after the injury. Patients will also notice a bump on the top of the shoulder that is different than the other shoulder when they look into a mirror. For most separations, the ligaments will heal in place and the patient will be able to use the arm normally again. The bump on the shoulder will always be there, but it will not get bigger or cause a problem. Initially, the injury is treated with rest in a sling and then a gradual return to activity is permitted over several months. For more severe separations, surgery is needed to repair the ligaments. This surgery is complex and can take 6 months for recovery.